What is Kung fu? Is it a style? No. Bruce Lee knew a Kung fu style, but it was called Wing Chun (Ving Tsun); he added various other techniques from boxing, fencing, and other disciplines to create his own style known as the Intercepting Fist Way. Is Kung fu a vehicle? Sometimes. Stars like Jackie Chan have used the discipline and beauty of Kung fu as a springboard to fame and stardom. So, if Kung fu isn't really those things, what is it? At Shaolin Kung fu institute we practice Lung Jop Pai, which means Northern Dragon style Kung fu. 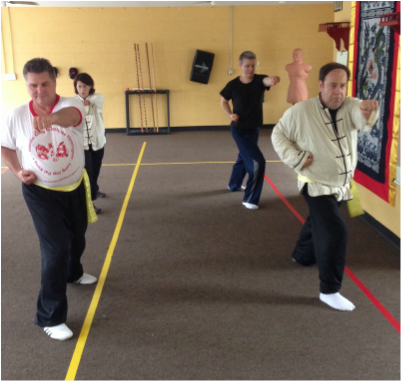 It is a self-defense and traditionally taught Chinese martial art that has been passed down from teacher to student over many, many generations. It is a unique art in that it is alive and grows as the student evolves within the art. It is unlike anything else you have experienced. When we say that Northern Dragon style Kung fu is a living art we mean that it evolves and grows as students learn more of it and their knowledge of the art becomes more intimate. It constantly challenges students to make connections—backwards connections to older skills and techniques, and forward connections from their accumulated knowledge to new understandings of techniques and skills. In Northern Dragon style students never stop thinking. The more students learn, the more connections their minds make. Students execute basic Northern Dragon blocking techniques in the context of completing a form. While there are many martial arts that require acrobatic leaps, dynamic athleticism, or the strength to break boards, bricks, or other inanimate objects, Northern Dragon is not one of those arts. In fact, Northern Dragon teaches students to stay firmly rooted on the ground, and with good reason—being grounded to the earth allows the generation of power from the feet on up. What this means is that as an art firmly rooted in the earth, your main physical concern will be building up the strength and endurance in your legs and core muscles that will allow you to maintain a stance for longer and longer periods of time. That’s why its a practice; a discipline. Anyone can do it, given the commitment to the practice. Yoga is the same…so is the violin, or piano…painting…any art requires commitment. With that said, Kung fu as a practice is great for people of all ages. It provides both a mental and physical workout. The dragon represented by Northern Dragon style Kung fu is not the winged, fire breathing, destructive western dragon familiar to most people; it is the eastern, and more specifically, the Chinese dragon. The Chinese saw the dragon as an incredibly benevolent and life giving creature worthy of reverence. Students mimic this mythical creature's movements. Like the Chinese dragon, Northern Dragon stylists float and sink, circle and twist, and expand and contract in response to attack. As the embodiment of benevolent, life giving, and revered creatures, a Northern Dragon stylist would never start an attack, and would do everything possible to avoid an encounter. However, if a fight is unavoidable, then an absolute and totally determined effort is applied to overcome a potentially stronger force. Following an attacker’s first sign of aggression, a dragon stylist does not hold back, but becomes an instantaneous and non-stop attacking force. The Shaolin Kung fu Institute Flemington name and logo are registered trademarks of Shaolin Kung fu Institute Flemington, LLC © 2016 Shaolin Kung fu Institute Flemington, LLC. All rights reserved.